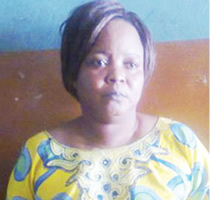 The men of the Ogun State Police Command have arrested a nurse, Adebola Titilayo, who owns a private hospital in Arogun Village, in the Ewekoro Local Government Area, for allegedly stealing a new born baby. The nurse allegedly took the baby was born and reportedly told the mother that she had a stillbirth. This incident happened on June 13, 2015, but policemen from the Ewekoro division arrested the suspect on Friday. It was gathered that the real mother of the baby got information that her baby did not die, but was with the nurse. The state Police Public Relations Officer, Muyiwa Adejobi, who confirmed the arrest of the nurse, added that neighbours of the nurse and the people in the community, who suddenly saw her with a baby without any pregnancy, became suspicious of her. “The nurse, who took the delivery of the baby in the hospital on June 13, 2015, had deceived the mother that she had a stillbirth. “She was arrested when the mother got reliable information about the baby and immediately informed the police. “The residents of the community also noticed that the suspect, who was never pregnant, suddenly started nursing a baby that she could not breastfeed. They informed the mother who later reported the case to the police in Ewekoro on August 7, 2015. Adejobi, a Deputy Superintendent of Police, said the police operatives had rescued the baby unhurt.